Christmas Tree Trail, holiday festivities return to Disney Springs at Walt Disney World again!!! The Christmas Tree Trail returns again this year, running from November 8, 2018 to January 5, 2019. 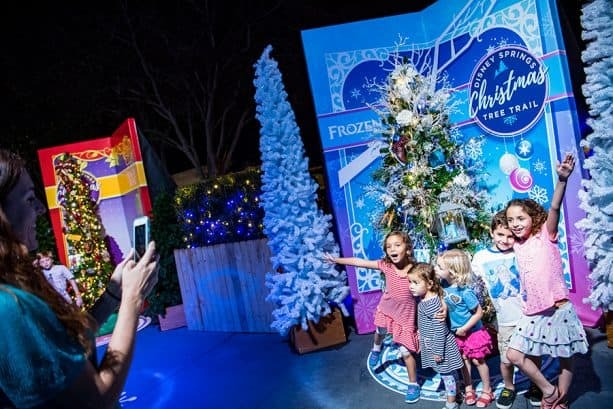 The trees, each dedicated to a popular Disney theme, feature characters like Mary Poppins, Mickey Mouse and Minnie Mouse, and are 10′ and 12′ tall with a 10′ backdrop for a guest photo op. Last year’s trees were: Disney Springs Logo Tree, Mickey and Minnie, Pluto (devoted to pets), Sleeping Beauty, Beauty and the Beast, Princess and the Frog, the Little Mermaid, Frozen, Snow White, Cinderella, Pinocchio, 101 Dalmatians, Fantasia, Villains, Lilo and Stitch, Dumbo, Tangled, Robin Hood, Peter Pan, Jungle Book, Muppets, Mulan, Mary Poppins, and Alice in Wonderland. Santa’s Chalet will be located at the end of the trail with snow and music. From Dec. 25-Dec. 31, Santa Goofy will take over after Old Saint Nick heads back to the North Pole. Located near the play fountain outside of Once Upon a Toy, the 2018 Christmas Tree Trail will include 27 trees! Guests will enjoy a walk-through wonderland filled with Christmas trees decorated with Disney imagery and characters with new additions inspired by Toy Story, The Haunted Mansion, vintage Mickey and Minnie Mouse, and Star Wars. Guests will experience a gentle snowfall, toy soldiers, singers, and lots of festive photo ops.